Summary: This project will continue STC's Tour de Turtles Educational Program through 1) deploying satellite transmitters on four post-nesting adult loggerheads in and around the Carr Refuge; 2) conducting educational activities at two live releases; and 3) providing up-to-date multimedia material for educators on the Tour de Turtles website. To enhance local excitement and media coverage of the program, STC will coordinate two live "starting" events around the release satellite-tagged sea turtles. These releases have been attended each year by over two thousand spectators and include sea turtle educational activities, such as a crawl-through TED, sea turtle research station, and mock oil clean-up station. Tour de Turtles will be promoted by targeting previously-registered educators, schools and educational associations via emails, websites, social media, and through program partners, such as Disney's Animal Programs. Results: STC has completed all tasks. 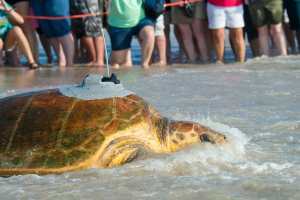 Over the weekend of August 1st and 2nd, four post-nesting loggerheads were attached with satellite transmitters and released at two separate public release events. The outreach benefits of this project are shown by the number of visitors to the Tour de Turtles and STC websites, as well as the turnout and coverage of the live release events. As of the date of this report, all four post-nesting loggerheads have been tracked for over 365 days, and three of the turtles continue to be tracked. One loggerhead (Melba) migrated around the Florida Keys in the Gulf of Mexico and is currently off the coast of Cedar Key, Florida. Another (Elsa) headed south to an area just north of the Cuban coast, then later moved northwest towards Key West, Florida to a second area. The third loggerhead (Anna) migrated to the northern coast of Key West, Florida. And the last loggerhead (Shelley) moved a short distance north to the waters off of Cape Canaveral, Florida. In mid-June of 2015, Shelley left the area and headed north along the Florida and southern Georgia coasts. She then moved off the continental shelf, following the Gulf Stream current Northwest until her transmitter stopped sending signals in an area close to midway between Bermuda and Nova Scotia. The Tour de Turtles site (from mid-July to mid Nov, 2014) had a reach of over 24,500 visitors and over 200,000 page views. The two live releases of the post-nesting female loggerheads were very well attended; over 1,500 people attended the events, providing the opportunity to increase awareness about sea turtles, their habitats and threats to their survival.